Summary: The Gulf of Mexico Fisheries Management Council in consultation with National Marine Fisheries Service suggested mitigation measures (collectively known as Amendment 31) in a Reef Fish Bottom Longline Fishery to restructure the fishery, including temporal, spatial, and depth restrictions. However, there are data from previous studies of satellite tracking of loggerhead turtles on the West Florida Shelf that demonstrate fishery overlap. Therefore, it should be evaluated whether Amendment 31 may require revision to mitigate the fishery pressure of bycatch on declining loggerhead stocks. The proposal will use satellite tracking technology to better address the key remaining questions that may be inadequately addressed in Amendment 31 as it currently exists, including (1) the vertical water column use by loggerhead turtles in the zone of overlap, (2) depth isoclines where loggerheads reside for foraging, and (3) residency through the year to test the efficacy of temporal mitigation measures. Results: Field work completed: a STGP grant for 10 STGP satellite tags was leveraged to expand the 2011 project coverage to 24 loggerheads. Tracking covered 100% of the females final internesting periods and 92% were tracked to a final home range. As of October 12, 2011, 19 of 24 tags were still transmitting. Notable results included 6 females residing on the West Florida Shelf overlapping with a fisheries bycatch region, 3 females from the BP oil spill region in the northern Gulf of Mexico, 3 inside Tampa Bay, 5 in Mexico, 3 in the Bahamas, 1 in the Atlantic, 3 in the neritic zones along the SW Florida peninsula, and 1 in the Florida Keys (an animal with a record 24 year nesting history on Casey Key, and a previous inwater captures by FWC at the Florida Bay foraging ground). Five remigrant turtles were tracked for a repeat history to evaluate fidelity to the foraging ground. Three of the retracked females returned to the same foraging grounds and tags on two retracked females ceased transmitting before a final location was reached. The two turtles were still heading toward their previous foraging ground(s) at the time of last signal reception. A widest range of loggerhead size distributions included females between 80.9 to 116.0 cm curved carapace length. A significant interseason rookery shift between Keewaydin and Casey Keys was documented by satellite tracking. 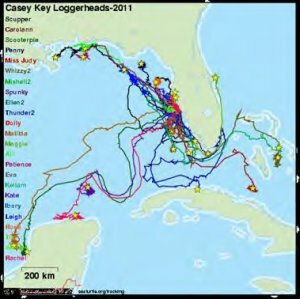 The 2011 results integrated with previous studies (2005-2011) reinforce that 22% (24/111) of tracked Casey Key loggerheads remain on the West Florida Shelf in areas that potential exists for interactions from the Gulf bottom long-line fishery.